A propos of the post of the WSJ article yesterday about the Greenies who want to get rid of the Klamath River dams, here is a photo essay of what one of those dam projects, the Boyle Dam, has done to the Klamath river. It isn't pretty. Photo below of the Boyle Dam. Doesn't look that bad to me. I like to bath regularly, eat fresh food, and have electricy in my house. Call me crazy. No power, not much water, no food. In the same list that y'all condemn-with-out-thinking. No logging, yup even the trees planted 80 years ago are "old growth" now. No farming, it takes water and chemicals to do that. No dams for electricity, fish are more important, but yet fishing is not banned. Considering the Feds and ORstate own most of the land, when they get rid of us pesky humans the farms and towns can go back to nature and the only thing you will do with Oregon is look in from outside. Debates about what is proper stewardship vs. good use vs. abuse of natural resources is an endless one. Personally, I do not like to see a river put into a pipe. And I do believe that we can get all of the power anyone would ever need from nuke plants. Phil: I hope you don't think that we are loony greenies here. Far from it. We like farms, too. We are farmers! 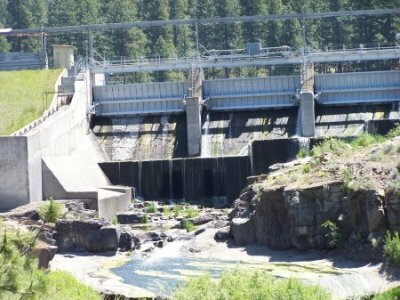 As you might notice from my attitude I have lived and worked around power dams for the last 35 years and have greatly benefitted from them and I do believe that the many benefits they provide outweigh the costs. With every type of power there is a trade off. Nuclear power must still be transmitted and this article from syracuse.com underlines the tradeoff. Windmills, i.e., bird cuisinarts, may be coming soon to a waterway near you BD. More than 300 people turned out tonight to voice their opposition to a plan by New York Regional Interconnect to build a $1.6 billion high-voltage power line that would run through parts of Madison and Oneida counties. The meeting, held at New Hartford High School, was organized by Rep. Michael Arcuri, D-Utica. Arcuri told the audience that he, along with the other local politicians in attendance, wanted to hear what they thought were the best ways to oppose NYRI's plan. The congressman characterized the gathering as a "team meeting" and asked state Assemblywoman RoAnn Destito of Rome, Utica Mayor Timothy J. Julian and state Sen. Joseph A. Griffo to explain what they were doing to prevent the power line plan from moving forward. More than 20 residents spoke out at the meeting. Several suggested that the state erect windmills in Long Island Sound to deal with power shortages Downstate. Many said they were frustrated that their communities were being left out of decisions about the power line. I wonder if "until the Californians started moving here" means "until the Californians that started moving here after we did". It does in many cases. And this also has nothing to do with dealing with dams of several types--some of those being "poorly thought out", "well thought out, but worn out", and several more. In some cases the dams are just plain well done and everybody gets along reasonably well. The immigration bigotry out to be just labeled what it is and dealt with on its own merits, if it is has any. I always try to help out people like phil from several states--fuel up before I get to the border, try not to stop except at the chicken coops and if necessary to ... wl nevermind. I know you weren't addressing me (or anyone in particular) re your immigration observation (how did that slip in there anyhow) but please, some aren't bigots just because their views differ from yours re the matter. And BTW, your full name was OK with me. I've always called folks by their given unless they requested different. The evil people in the earlier post were California emigrants. Oregon used to be Republican, conservative territory, mostly. This state was built by the largest migration in US history, the Oregon Trail. You might have heard about that. Those people all had something in common and that spirit has lasted, until all the loony greenies and socialists started jumping the good ship California to come here. They did not have that same spirit in common with the pioneers. Now the state is run by Portland, for Portland. Public Employees (past and present) and their families make up an unbeatable voting block. Everyone wants to climb on the wagon, not pull it, and many wish to crack the whip. Larry- In no case do the dams get along with fish or enviros. All dams must go. No nukes will be built, in fact they just tore one down- Trojan. I don't give a crap if people move here, just don't go turning Portland into San Fran Sicko on the Willamette. Why on earth Larry thinks I don't like strangers from other states... I just don't like commie pinko enviro elitists and their anarchist teenaged kids. Some animals are more equal I guess, I am resigned to work harder. I'm sorry, I thought I recognized the rhetoric from the "Welcome to Oregon. Now Go home." sign on US 99 when I was a kid. Oregon has some good stuff--we import cheese from Tillamook county when we can't find it here, there are other good things. But your stated and advertized polices toward newcomers, and you hostile environment for commercial trucking (which you depend heavily upon) fit well with the overall opinion I have for Oregon as a place to visit. Strikes me pretty much as a "I got mine, now let's do what we can to make sure you don't get yours" kind of place. But I'm not gonna work on that problem any more. i never noticed an anti-trucker mood here. Mostly it's anti-SUV and anti-car in general. Anti-capitalist, anti-freedom, anti-republican, anti-life ("choice"), anti-straight- these things are the real reasons to either: visit, or move here to help swing the pendulum back where it belongs. At 55 MPh with the nutcases around the truck in and out like crazed wasps, doing what 80? Drop in at the chicken coop while your DOT folk greet us. Haven't been there for a while, how are wer doing ofr a place to park? I said I wasn't going to work this anymore, and the part I was talking about, I won't. There are some dams that should never have been built. San Francisquito. O'Shaughnessy. Anything in the Owens Valley. There are some that were not planned very well (any that cut off the fish, there are others. Anything the Corps of Engineers has done to the best of my limited knowledge been a disaster. But there are dams that have been a benifit to all, or at least not a detriment. I don't think of a Pelton wheel house or associated dam built by PG & E that has been a problem, and I think of several that have been generally good for all concerned. I don't know anything about Pacific Corp, but I'll be surprised to learn that it is much different. There are ways to build dams that do good things at minimal total cost (total cost = capital outlay + environment + on-going expense). I don't have anything against well designed nukes (same issues, really). I don't like windmills much because the blight so much land. I don't know if wave machines will ever become feasible. solar seems to me to be more expense than it is worth, but I am willing to be instructed. Who did I neglect to offend? Forgot the footnote, but it won't let me fix it. I guess it is just plain not going to let me post it. Mr. Dog has it in email if he'd like to post ir for me. Klamath Blue-Green Algae is naturally rich in amino acids, minerals, vitamins, fatty acids, chlorophyll and protein and may help increase energy, decrease fatigue, enhance brain function, oxygenate the blood, nourish the nervous system, improve memory and concentration, increase muscle mass, speed healing, protect against pollutants and radiation, purify the blood, relieve kidney stones, and improve over-all health. Posting an add to sell something that was pointed to as a sign of distruction seems Just Wrong.